Tonight! | Head's Hate Blog! Posted on September 27, 2013	by HEAD'S HATE BLOG! Went to United Record Pressing in Nashville. Apparently they press other records besides ours. Go figure. Heading to Memphis for our rock concert tonight at the Hi-Tone as part of Gonerfest 10. See you there! 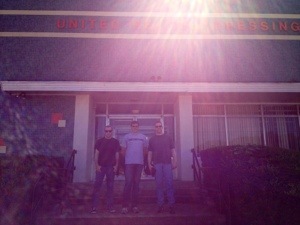 Outside United Record Pressing, Nashville.